Since the internet has taken off and become a mainstay of our society, being in business has changed forever. Now, there are a huge amount of opportunities to be found in the new digital marketplace that we find ourselves in. But this means that there’s also a huge amount of competition too and as such, growing a business online is not a particularly straightforward affair. This is especially true of those businesses that don’t have a huge advertising budget and whilst the odd startup may be lucky enough to get a good amount of financial backing, this isn’t the norm. All of this means that in order to compete and to enable growth, business leaders need to get a little more creative. And that’s where growth hacking techniques come in – they’re not costly, quite the opposite actually, and they can seriously boost growth. Growth hacking is a term which was coined by Sean Ellis back in 2010 when he found that the marketers that applied to work with him didn’t really possess the skills he was looking for. Whilst marketers are obviously very valuable in every business, for startups the skillset that they tend to have doesn’t quite fit the needs of a company in its infancy. With this in mind, Sean invented the term growth hacking to describe a practice that follows certain conventions which are concentrated in one key area – growth. According to Mattan Griffel, a partner at GrowHack , “a hacker is someone who is more concerned with achieving an objective than following a prescribed process” and this is just as true for a growth hacker. He goes on to explain that a “growth hacker is a hacker whose objective is to grow the number of users for a specific product.” It’s a “cross-functional role” and growth hackers tend to have coding skills, as well as marketing, and a good understanding of analytics. One of the first principles of growth hacking is in product-market fit , which means that if you’re going to take a product to market then you must first ensure that there’s a good demand for it and that the people that you’re targeting have a real need for the product, even if they don’t know it. For many years marketers have worked on the principle that they have a product and even if it doesn’t necessarily fit the market, then they’ll have to make it. This is plainly a flawed approach and one that growth hacking rejects. Growth hacking relies on this, WOM (Word of Mouth) marketing, studying analytics to pick up trends and adjusting as necessary and presenting a software product (or website/app, etc.) in such a way as to ensure referrals. Sean Ellis applied these principles to Dropbox, as at the time he was in charge of growth for the company. Dropbox were spending a substantial amount of cash on AdWords at the time, but not really getting anywhere before the growth hacking techniques were employed. These days, the company is worth around $10bn as of January 2014, according to a Forbes report – and the majority of the growth that the company’s seen has not relied on ad spend, so it actually has spent very little on advertising at all overall. So without further ado, let’s have a look at some of the most effective growth hacking techniques that you can apply to effectively grow your online business. Check out the image below – what’s the first thing that you notice? For me, it’s two things: the offer of up to 16GB free space if you invite friends and the blue button, which again, allows you to invite email contacts. This is a growth hacking technique in action and not just because of the strong CTA, but how the entire landing page is constructed. As you can see, it’s very plain which ensures that the eye is immediately drawn to the CTAs. Human beings all love to get something for nothing and so to encourage growth and WOM, it’s necessary to give it to them. Note too the use of social media buttons as further ways for users to share the service and spread the word. I first discovered Dropbox myself when I was at university and one of my lecturers mentioned it in class. I Googled it back home and then proceeded to invite people as and when I needed to share files. Now I have around 7GB which holds a really good amount of files, including images, video and website files. And that’s how it’s gone for the company, person A tells person B who wants more space so invites others at every opportunity. You can see that in a school or university environment it would spread like wildfire as students and teachers both need to back up files to more than one location and ensure that they can access both at home and school. Ideal. By offering this, Dropbox saw its users grow from 100,000 to more than 4 million in just 15 months – wow. A strong landing page then is vital in the early stages of growth and should be clean, simple and encourage sharing and referrals. A/B testing should be carried out and analytics studied to pick up trends. Ideally, this should be done before launch so that you’ve collected a good userbase in the first instance and begun the cycle of acquisition, referral and retention . This isn’t a one-off either, it should be studied and repeated for best results. This technique is employed by many online businesses, especially social networks. A recent example of this is the new social network Ello, which not only claims to be the only network that will never serve ads, but also requires an invite if you want to join the site . This is not a new technique, sites have been using the invitation only ploy for some time. Pinterest, for example, was invitation only in the beginning and in the first instance users who requested an invite were often told that there was a long waiting list, but that they would eventually gain access. Exclusivity works – it makes people feel that they’re a part of something special that others are not. Pinterest gained more than 70,000 users by October 2013, just three years after it first launched and indeed, Ello has seen a huge response to its invitation-only set-up. The reason for this sudden jump in traffic was simple. They offered something different, which the market was ready for in the wake of a number of high-profile privacy concerns from the other social networks. This, and the lack of being able to sign up immediately meant that Ello was soon swamped with requests. It may have been unintentional on the part of the owners, but it was a growth hacking technique all the same. One of the problems that many startups suffer is the lack of an audience to showcase products to. Influencers tend to have large social audiences (and social should play a pivotal role in your growth hacking) and so in order to find an audience, you should court influencers so that you can basically piggy-back off theirs. Firstly, you should use a discovery tool to identify influencers in your niche. Once you’ve done this, you should consider tactics for getting their attention. Often, a well written blog which mentions the influencer is enough to get you noticed and from there, you can begin to build a relationship. You should remember to include those who write for tier one publications such as Forbes or Business Insider (or one suitable for your niche) and request that they do a piece on your startup. There’s plenty of competition out there when it comes to this though, so do ensure that you sing your product’s praises and put across what’s different about it and why it’s needed in your target market. This will extend the reach of your audience and boost your online presence, leading to more sign-ups and referrals. 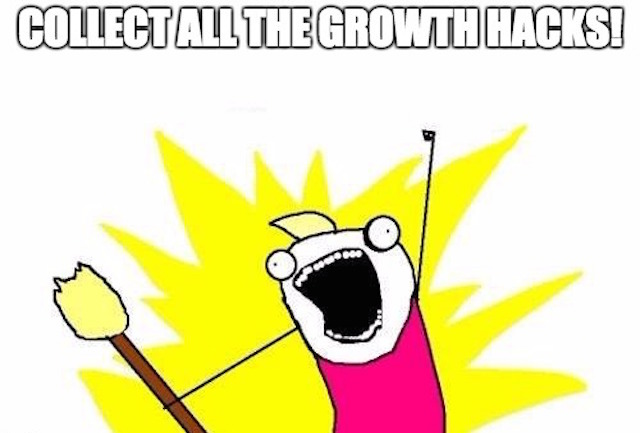 Growth hacking is a set of techniques that focus on goals, the use of analytics to track them, discover strengths then further optimize. This, alongside a product that fits the market, is the key when implementing growth hacking techniques. There’s plenty of other techniques out there and you don’t have to be able to code. Growth hackers have a unique skillset and often this includes programming abilities, but it’s not absolutely necessary. So the idea that you should spend thousands on advertising and marketing is the one that’s most likely to lead to failure. We have social media – use it. We have free analytics – use it. We have lots of means to leverage the internet in order to enable growth in your startup and all you need to do is strategise and use the free resources at your disposal. This reduces overheads, is generally more successful and gives your business the best chance of success and more importantly, healthy and strong growth. For a comprehensive guide to growth hacking I would recommend to read Quick Sprout’s definitive guide , as well as the aforementioned book.